Pig production in the UK has a long history but the stats suggest that the sector has shrunk significantly in the last two decades and it now provides only about half of the country’s pigmeat needs. Farmers have blamed the industry’s loss of competitiveness on: disease outbreaks, high feed prices, environmental regulations, the multiple retailers, and, most frequently, the high cost of new welfare standards for pigs that were introduced in 1999. Whatever the reasons, the UK’s pig industry has, over the last twenty years, reduced to about 60% of the size it was pre-2000. It has, literally, been on the cliff edge several times in this period. But there are signs that confidence is returning and that productivity has been improving in recent years. At farm level and in the input supply and processing value chain significant concentration has occurred. There are about 10,000 pig farms in the UK but c. 90% of production comes from about 1,000 assured farms including 10 corporate companies which account for c. 35% of the breeding sows. There are just two large players in the feedstuffs sector and three large players dominate the slaughter and processing functions. 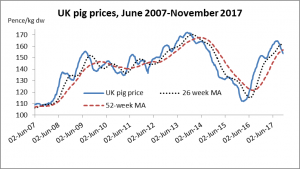 Recent pig price increases also suggest that things are looking up. But, if post-Brexit trade policies stimulate more imports and higher labour costs the UK pig industry might yet be looking over another cliff edge with another round of contraction in the years ahead. 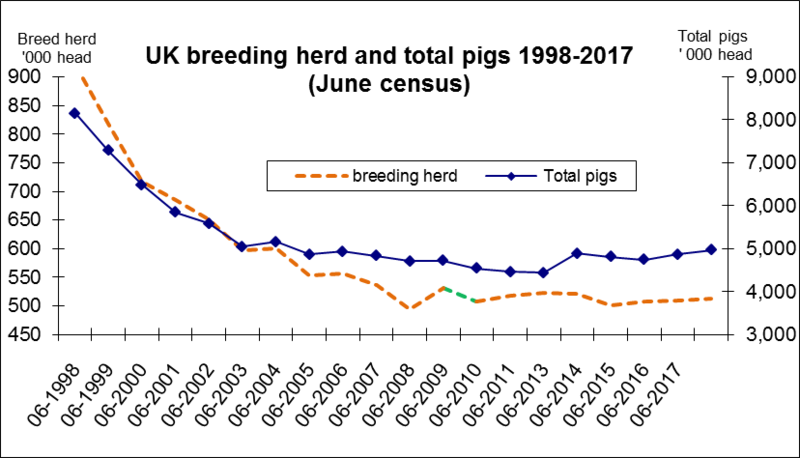 My first chart illustrates the scale and timing of the contraction in the last twenty years and, more recently, the modest recovery in the UK pig herd and its output. The UK now supplies less than half of its total domestic pigmeat consumption with around 60% of all the pigmeat it consumes being imported – that amounts to just under one million tonnes each year. The EU supplies almost all the pork imported into the UK, due to high import tariffs on pork from outside the EU and that underlines the significance of the post-Brexit trade policy – lower cost third country suppliers will be queuing up to access the UK market if post-Brexit trade deals permit. Denmark is currently the UK’s largest supplier, accounting for over a quarter of all UK pork imports. Along with Germany and the Netherlands, these three EU countries account for about two thirds of the UK’s imports. Fresh and frozen pork accounts for about 40% of all pig meat imports (the rest is processed products). 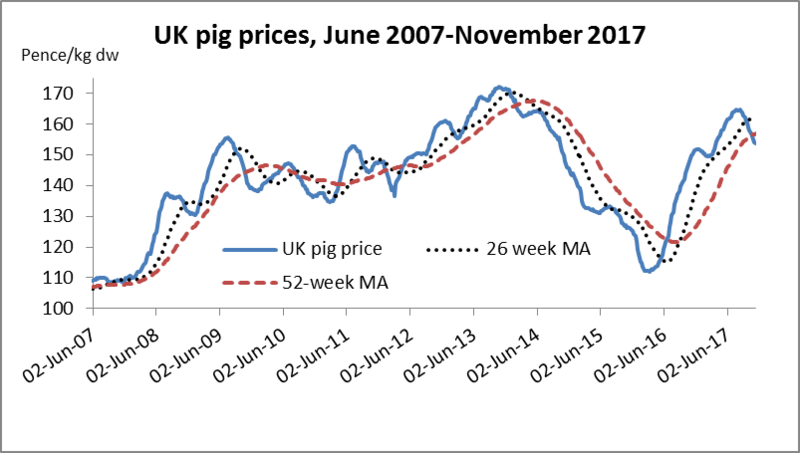 My second chart illustrates how pig prices have behaved in the last decade. From the early 2000s there was a long, slow recovery in prices but the period since early 2014 saw big price falls. Since the second half of 2016 prices have bounced back but the most recent price movements imply that a downswing in prices may just be starting at a time when, post-Brexit, there is uncertainty about market access and levels of competition. We shall see. What do all these numbers and the charts shown here say about the UK pig industry’s future? Well, there is no doubt that the industry has “thinned out” over the last 20 years and that there is a commercially viable “core” in the UK pig production/processing value chain. This is the legacy of the post-2000 contraction. However, Brexit brings uncertainty, new challenges, and more risk. The UK’s competitors are not standing still – even if protective tariffs are maintained post-Brexit and/or a “soft Brexit” deal is secured. Welfare standards are improving in foreign suppliers, the use of antibiotics, new environmental regulations, and developing pork products in their competition against chicken are all strategic areas where the UK pigmeat value chain will be tested. 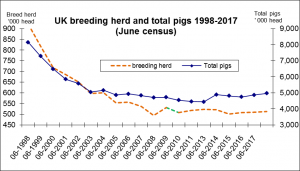 And, of course, there is the ongoing productivity handicap for UK pig producers of the British public’s fascination with “outdoor-reared” pigs. That handicap may also be extended to the labour function if non-UK EU workers are discouraged from remaining or coming to the UK to be employed in the UK’s pigmeat value chain. The UK’s pig farmers, their suppliers, and the processing chain may be living on the edge for a bit longer yet.